Each year on November 11th cities and towns across the country find many ways to celebrate and honor our nation’s veterans. The Atkinson Community Center has been holding a special Veterans Day Breakfast for the last 15 years, and this year students from Timberlane Regional High School were a part of the event. 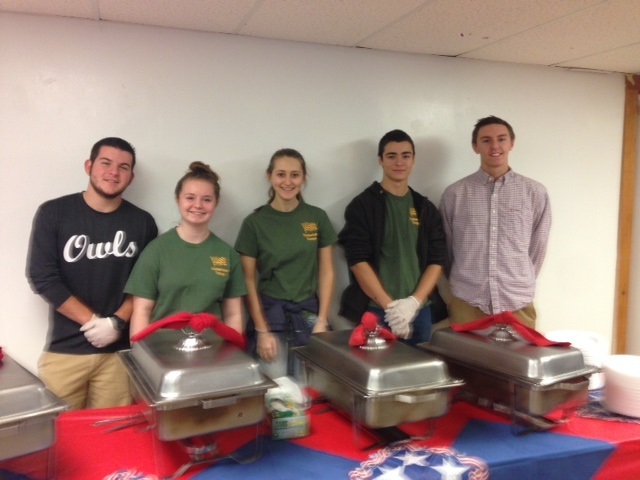 High School Students from the Rho Kappa Social Studies Honors Society, The Timberlane Troops organization, and the National Honor Society volunteered to help set up and serve breakfast to our local veterans at the November 11th event. Students were honored to lend a helping hand and meet many veterans from the district. Thank you to the Atkinson Community Center Recreation & Senior Programs Director Noriko Yoshida-Travers for organizing the event and welcoming our students to the center. They were certainly honored to be part of such a special day to thank those who served in our nation’s armed forces. As a community partner the Timberlane Regional School District looks forward to many more opportunities to work with the Atkinson Community Center and support their upcoming events. TRHS students (l-r) Drew Hogg, Kathryn Thomas, Tatiana Trombly, Tyler Connolly, and Brian Mickalay are ready to help serve breakfast at the Atkinson Community Center Annual Veterans Day event.